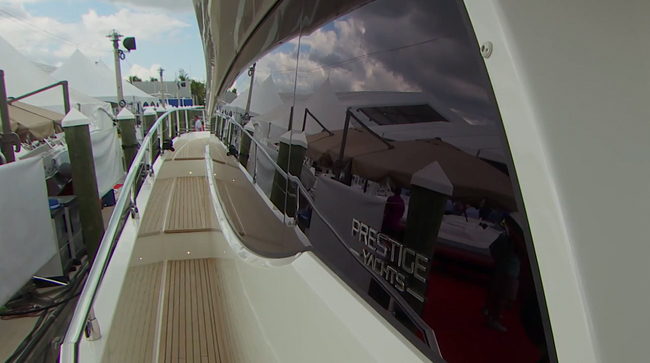 Can a motor yacht be both fast and comfortable? You bet. 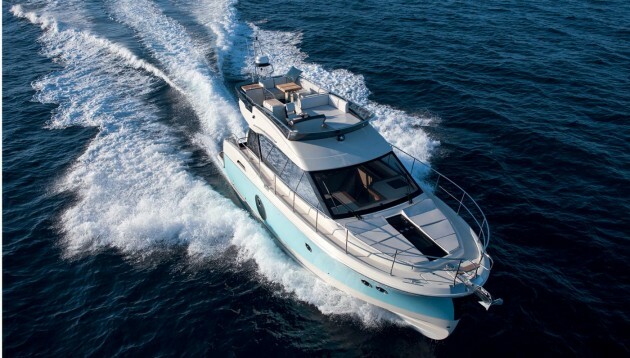 After reviewing a number of motor yachts earlier this year, I was excited to hop on board the brand-spanking-new Beneteau Monte Carlo 4, a 45-foot flybridge motor yacht of high pedigree that debuted at the Newport Boat Show in Newport Beach, CA. It’s a model replete with impressive performance and opulent comfort features throughout. The Monte Carlo 4. Twin Volvo IPS pod drives, speed, and lots of luxury. At first glance, the Monte Carlo 4 has a striking, almost sports-car-like appearance. 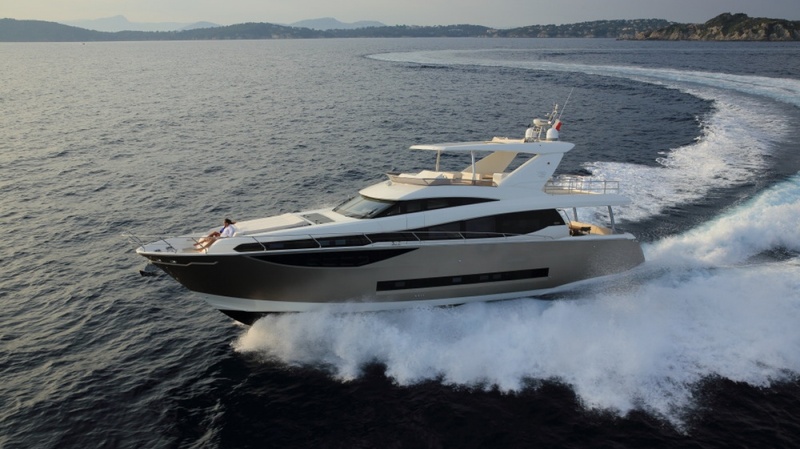 Much of that look can be attributed to its raked-back, one-piece windshield and the lines of its cantilevered flybridge, which extends completely over the aft cockpit. Look from the side, however, and this boat has a more yacht-like look, with a graceful sheer line that gradually rises to a plumb bow, and multiple circular ports that break up the topsides. The outside spaces on the Monte Carlo 4 are nothing short of spectacular. Starting aft, there’s a huge, teak-decked swim platform with tons of space for just about anything you’ll do close to the water. One step up through a large, welded, stainless-steel transom door brings you to the capacious aft cockpit, which has more of that beautiful teak decking. In fact, that teak decking extends right up into the main salon. There’s a wide three- or four-person lounge (it’s so comfortable-looking that I kept calling it a couch during our sea trial), with a smaller bench to port. Our test boat didn’t have something I’d like to see back there, though: a table. A set of steps on both sides of the aft cockpit lead up to the narrow side decks going forward, but plenty of handholds make the trip easy. I really liked the height of the bow railing, which starts slightly aft of the forward end of the cabin house and sweeps elegantly forward to the bow. 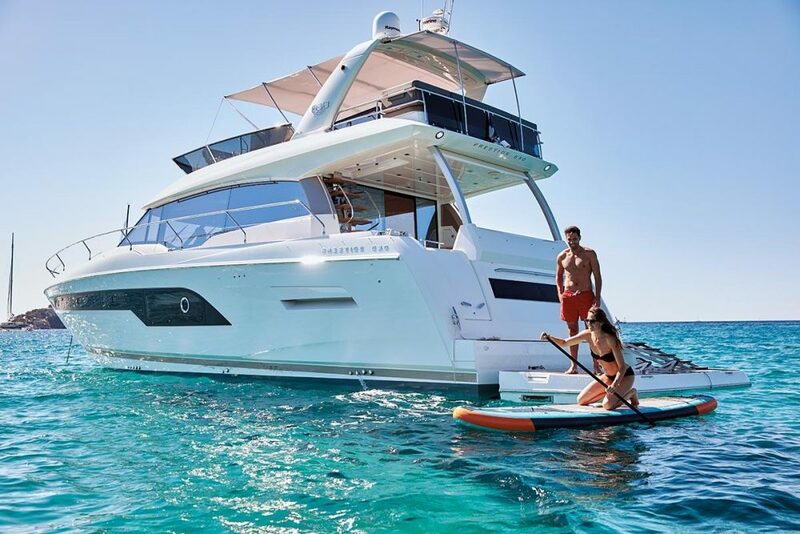 It gives a secure feeling not only when lying down on the two foredeck sun lounges, but also during anchoring maneuvers at the bow. That said, I wasn’t thrilled about the unsubstantial stanchion bases used for the railing; I was able to wiggle the bow railing back and forth in many places. The aft galley makes entertaining guests in the aft cockpit a breeze. Note how the aft sliding doors completely fold open to create an extension of the main salon. Head back to the aft cockpit and you’ll find a flight of beefy teak steps that lead up to the flybridge. The helm is situated forward to starboard and is bordered to port by a two-person bench and large sun pad. Behind the helm is a wet bar. The aft section of the flybridge is dominated by a huge C-shaped lounge that I estimated could comfortably entertain about seven or eight people. Centered here is the probably one of the most robust teak tables I’ve ever seen on a boat, mounted to a base that was equally sturdy. I go on more than a few boats where the tables wobble, so it’s worth praising. The twin Volvo Penta 370-horsepower turbo diesels are situated under a large, electric-lift hatch in the cockpit, and are mated to twin IPS 500 pod drives. System components in the engine spaces are neatly labeled; wires and hoses are run with great care; and access to all sides of the engines is excellent. 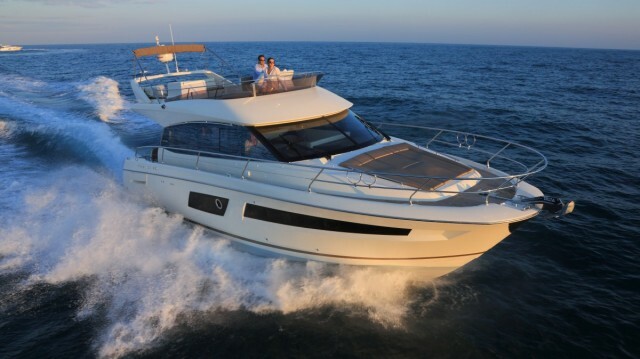 Beneteau also paid a great deal of attention to sound proofing and deadening in the engine space. Pair this sound-deadening with the inherent quietness of the Volvo Penta IPS system, which vents all exhaust gases underwater, and you’ve got the fixings for an amazingly quiet boat, even at full throttle. Inside at the lower helm station at almost 30 knots, I recorded 65.6 decibels (with my smartphone’s very unscientific decibel meter). 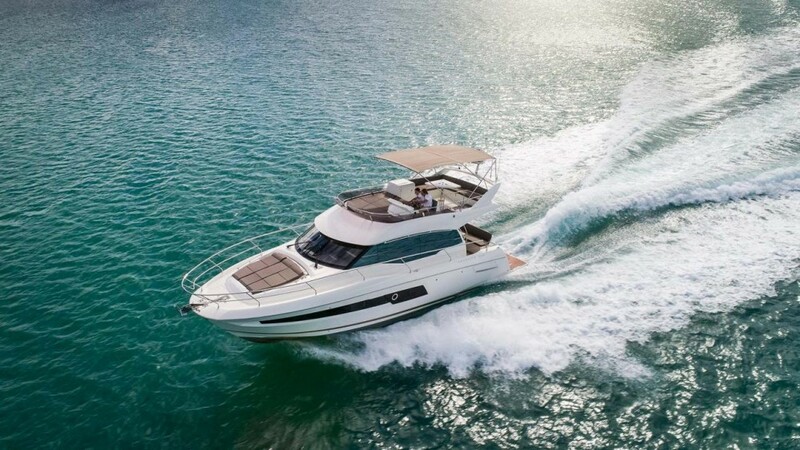 Twin Volvo IPS 500 drives and 740 total horsepower mean the Monte Carlo 4 can push 30 knots. Performance with the twin 370-horspower diesels was exceptional. With the throttles laid all the way down, I recorded a top speed of 29.6 knots and a fuel burn of 42 gallons per hour, with a full load of people aboard. The best cruise speeds were between 20 and 23 knots, where fuel burn settled down to between 28 and 29 gph. Back at the dock, we nestled the big 45-footer backward into a tight slip with ease, thanks to the IPS joystick system. Our test boat also had dynamic positioning, which means you can literally “park” the Monte Carlo 4 on the water. With dynamic positioning engaged, the engines, GPS, and a computer system work together to keep the boat stationary, regardless of wind and current. Stepping into the Monte Carlo 4’s interior spaces surprised me a bit; there’s not a piece of dark wood to be seen. Instead, the interior is finished throughout with an engineered product that looks like whitewashed oak, which creates a light, airy feeling. Everything below—from the light switches to the air conditioning vents—exudes a feeling of richness and luxury. Many parts of the interior are even accented with hand-stitched leather. Light wood paneling and modern accents give the Monte Carlo 4 a rich, yet minimalist feel. The galley is situated in the main salon aft and to port, which is the norm on boats like this. That's because it facilitates entertaining guests in the aft cockpit and up on the flybridge. Slide open and fold the glass doors at the aft end of the main salon and you’ve got yourself an open concept floor plan that flows right out into the aft cockpit. There’s plenty of stowage and counter space in the galley, but not a single sea fiddle on any flat surface, which means dishes and plates can go flying off underway. A two-burner electric cook top, convection microwave, and small refrigerator/freezer are standard. There’s a C-shaped dinette to starboard and aft, and the lower helm station is situated just forward of it. The windshield is made of a single piece of glass and is angled back in such a way that it does double-duty as a sort of skylight for the set of curved steps to port. There’s good fore-and-aft visibility from the lower helm, and I really liked how quickly the sliding electric window panels worked for creating a breeze here. Down the aforementioned set of curved steps from the main salon are two staterooms. The master stateroom is a full-beam, mid-cabin affair, located under the main salon with its own enclosed head and shower. I’m not a fan of these mid-cabin staterooms and it’s because most of them are lacking in headroom, as this one is. Sure, there’s a stand-up area near the head and to one side for getting dressed, but getting to the rest of the stateroom, including the queen berth, requires stooping down. I did like the large inset hull lights down here, which give an open feeling to a space that would otherwise feel quite dark and cut off from the outside world. As with everywhere else on this boat, the finishes and upholstery are plush, rich, and luxurious. I especially like the way with which the cabinetry smoothly opened, and then closed with a solid-feeling “thud.” Forward in the bow is a guest stateroom with center-line double berth, plenty of headroom, lots of stowage cabinetry, and ample of light and ventilation. It doesn’t have its own enclosed head and shower, but instead shares the head and shower combo just outside. It would have been nice if Beneteau could have figured out a way to engineer an additional door to this head from the guest stateroom, but that's not a deal breaker. I had a blast with the Monte Carlo 4. 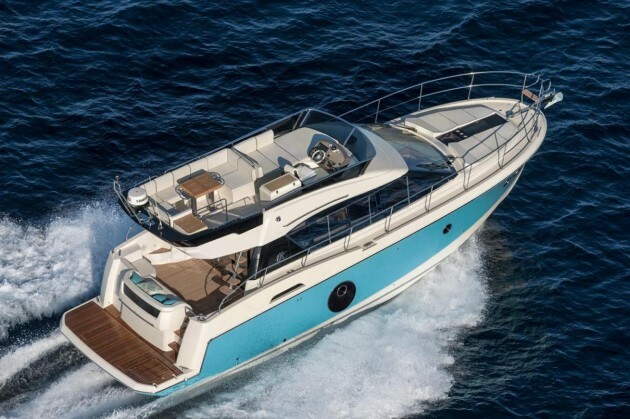 And if a fast and capable flybridge motor yacht with lots of luxury baked in is your idea of boating bliss, then the Monte Carlo 4 should definitely be on your short list. 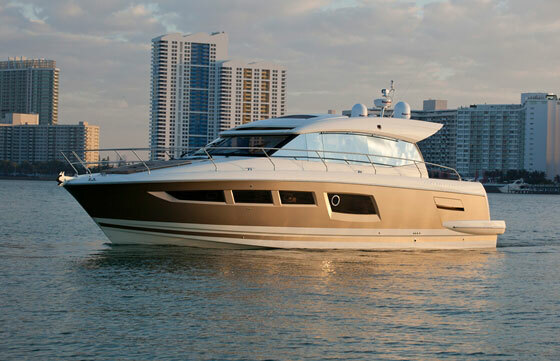 Other Choices: The Prestige 450 is another luxurious and capable motor yacht in this size range. 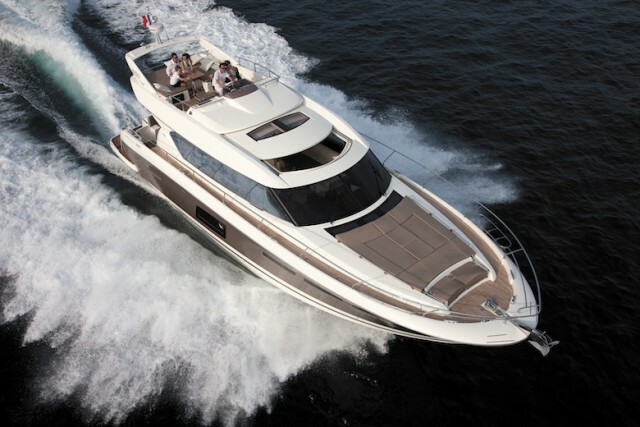 You may also want to look at the Monte Carlo 5, larger brother to the Monte Carlo 4. 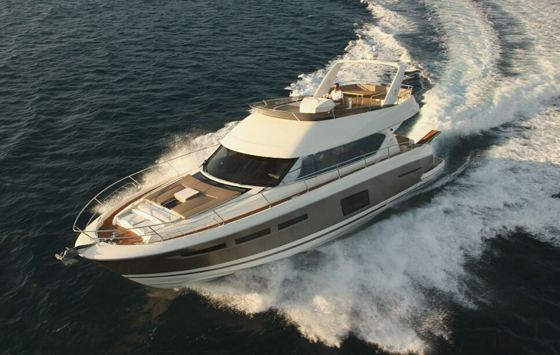 See listings for Monte Carlo 4 motor yachts For more information, visit Monte Carlo.